Phishing is a form of fraud where an email sender pretends to be a legitimate company in order to trick the email recipient into sharing important personal information like passwords and account numbers. Does the email make sense? Example are you getting a message from a retailer you haven’t shopped at in years. Be wary of shortened links including tiny.cc, bit.ly, ow.ly, goo.gl, and t.co.While some cases such as twitter call for character limits and URL shorteners can be helpful. We strongly recommend refraining from clicking on links obscured by a URL shortener in an email. 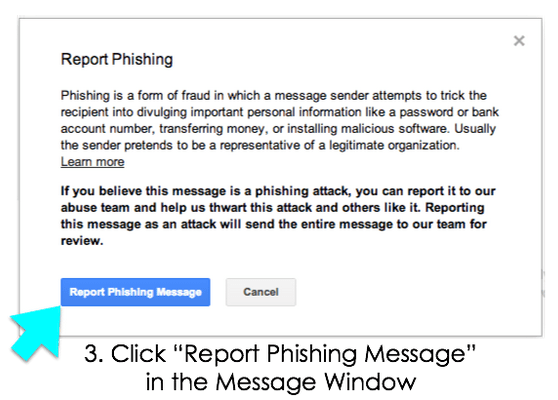 Reporting a message as phishing will prevent that user from sending you more emails. Also, the Google abuse team will use the report to help thwart the attack and others like it. 4. The Email will be moved to Spam – after you report the message you can delete it from your Spam. What if I accidentally respond to a Phishing message? Please contact TechHelp@fitnyc.edu with the full email including headers that you replied to and Change your Password. 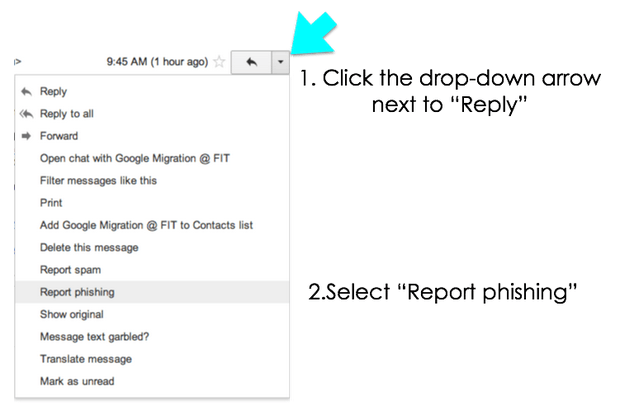 Click to enlarge the recent Phishing examples sent to members of FIT. Play the Phishing Scams Avoid the Bait game from the FTC.